Got bad eyesight but hate wearing impractical glasses? Contact lenses are a great solution, but the cost can put some people off. With a Vision Direct coupon, you can enjoy fantastic savings on a wide range of contact lenses. Whether you're looking for daily disposables, monthly lenses or specialist contacts for conditions like astigmatism, a Vision Direct discount code is a great way to look your best without breaking the bank. Originally known as Get Lenses, Vision Direct was founded by a team of expert opticians way back in 1998. 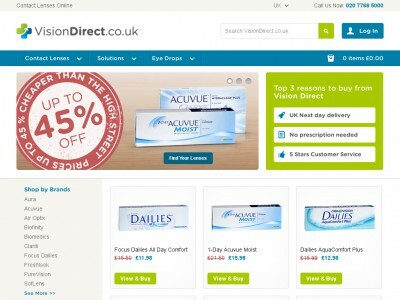 Set up to provide customers with a reliable, affordable way of buying their contact lenses online, Vision Direct is now the UK's largest and most trusted online retailer of contact lenses, solutions and eye care products. By purchasing directly from authorised sellers and offering their lenses online, the company is able to pass on a significant saving of up to 45% on high quality lenses from the world's leading brands. So if you've always wanted to try contact lenses but didn't think you're budget could stretch to it, Vision Direct is a great place to start. The company's comprehensive online store stocks a wide range of contact lenses from recognised brands such as Acuvue, Focus Dailies and Air Optix. Serving over 700,000 customers around the world, they know a thing about customer service too – so feel free to have a chat with the knowledgeable staff at their award-winning, UK-based customer service centre if you need advice on which lenses are right for you. There are plenty of different types to choose from, from monthly lenses which you clean in solution every night to daily disposables, which are thrown away at the end of every day. Vision Direct employs nearly 100 members of staff in offices in Amsterdam, London and York, all working tirelessly to deliver the best value contact lens solutions to their customers. As well as a wide range of contact lenses the online shop also offers a selection of eye care products including contact lens solutions, prescription goggles, eye drops, ocular vitamins and much more. And once you've chosen your products, you can enjoy superfast, reliable delivery to get your lenses to your door in record time. Want to get shopping with Vision Direct? With a Vision Direct coupon you can enjoy fantastic savings on your order. Whether you're bulk buying lenses to save money or trying contacts out for the first time, a Vision Direct promo code will help you see clearly without spending a fortune. Browse our website until you find a Vision Direct coupon that's right for you, then navigate to their website to begin shopping. Select your prescription details and click 'Add to basket' to purchase. Enter your Vision Direct voucher code and click 'Apply'. Want to find out more about ordering contact lenses with Vision Direct? Why not pay a visit to the company's dedicated YouTube channel here? You'll find lots of interesting content such as TV spots, FAQs, special offers and more. You can also use this channel to find out more about saving money with a Vision Direct discount code. If you've enjoyed shopping for great value contact lenses with Vision Direct, you might enjoy browsing some of the other stores in our Beauty and Health section. Try The Body Shop for great deals on natural cosmetics, or Myprotein for fitness fantastic. Enter your Vision Direct coupon and click 'Apply'. Enter your address details and click 'Proceed'. Enter your payment details and click 'Place order' to confirm your purchase. Standard UK delivery is free on all orders over £49. On orders under £49, a delivery charge of £2.98 applies. If you need to return a product for any reason to Vision Direct, you can do so by simply returning unopened boxes to the company's freepost address within 6 months of receipt. Need to contact the team at Vision Direct? Whether you have a question about your order, want some guidance on choosing the right lenses for you or just want to find out how you could make big savings with a Vision Direct voucher code, you can contact the Customer Services department by telephoning 020 7768 5000. Want to find out more about what's happening behind the scenes at Vision Direct? Why not follow them across your favourite social media platforms? You'll find lots of entertaining content like competitions, special offers, industry news and gossip and much more. You can also use these pages to find out more about saving money with a Vision Direct promo code. Buy now online at www.visiondirect.co.uk. I've worn contact lenses since I was a teenager, but they don't come cheap. That's why I was amazed to discover how much I could save with a Vision Direct coupon. They've got lenses from all the top brands at visiondirect.co.uk – I just chose my current brand and entered my Vision Direct discount code for a fantastic deal. Now I wear lenses every day – I just use a Vision Direct promo code to order my monthly supply for a fraction of the cost. So if you wear contacts, try a Vision Direct voucher code for big savings!